Hi, this is Leigh, the Director of Intake for Doodle Rock Rescue. Rehoming a dog is never easy, no matter what the reason! Every week, I work with families who have to make the difficult decision to rehome their doodle. Whether it’s a change in the family dynamics, moving or a behavioral/medical problem, I am here to listen. It’s my responsibility to assess each dog and move them into a foster home where they can thrive, while our adoption team thoroughly screens new adoptive families. To begin, please e-mail me. I will send you a questionnaire to complete about your doodle. I ask that you be detailed & honest, this information will help me place your doodle into the right foster home. I understand not every dog is the right fit for every family, nor is every family the right fit for every dog – that is why we are here! Ready to begin the rehome process? Get started by clicking the button below. Doodle Rock offers rehoming services throughout Texas and all neighboring states. 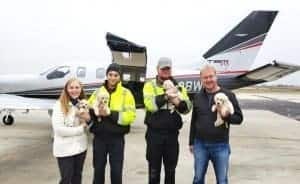 Thanks to our amazing volunteers, ground and private plane transportation is available to ensure your furry guy or gal gets to us safely. Rehoming your fur baby is a very difficult decision. We never thought we would ever have to go through that with our dear Frodo. I wanted Frodo to have the best life ever and the moment I spoke to Doodle Rock Rescue, I knew that they were my #1 choice. They were so understanding and empathetic towards us and patiently answered all our questions. I only experienced kindness from the moment I talked to them to when Frodo was picked up from our home. They have been so gracious in sending me updates about him. I would definitely recommend them to anyone who is thinking about rehoming their fur baby! Working with DRR was amazing. We actually considered putting our dog on Craigslist but really wanted to make sure she got a loving home. The transition was easy and it was really good for one of my daughters, who was super attached to our dog, to see the loving people we relinquished her to. They were obviously huge dog-people who knew how to read behavior and immediately loved our dog. Thank You DRR!!! Going through a divorce was hard enough on my children and me. Working with Leigh made us feel at ease. We knew we could no longer provide our precious doodle the home she deserved. We never felt pressured from Leigh, only unconditional support. Doodle Rock is an amazing organization and one I would highly recommend to anyone if needing to re-home their doodle. Thank you DRR, from the bottom of my heart! A couple of years ago I found myself in the unimaginable position of having to surrender my beloved Aussie Doodle. A series of events lead me to Doodle Rock and these kind and compassionate women offered me a way to keep my fur baby safe. They were wonderful and welcomed him with open and loving arms. They cried with me and gave me the support I needed to make this necessary but heartbreaking decision. I am a life long supporter of this group. My fur baby is happy and living the life he truly deserves. Our family purchased a doodle puppy in August of 2018. She was a great dog but we found ourselves in a situation where we needed to re-home her. I contacted Doodle Rock Rescue and spoke with Leigh. She was amazing from the beginning! She was helpful, kind and understanding. She arranged transport for our sweet dog and we are so grateful that she went to a place where she will be loved! Thank you Doodle Rock Rescue! I’m so glad we found Doodle Rock Rescue. 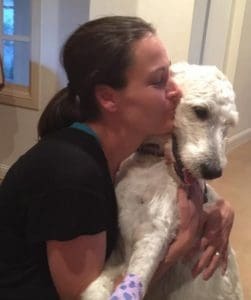 Leigh and her team met us with zero judgement – and TONS of love and passion for our Doodle, and quickly lined up a sweet foster family who is equally as passionate about giving the love and care every Doodle deserves. They made a very stressful and tearful experience turn to one of confidence that my doodle was going to a loving, deserving home that could meet her needs. Doodle Rock Rescue is professional and compassionate to both humans and dogs alike. Deciding to Rehome your family pet is never an easy decision. When our family made the tough decision, Leigh was there to answer all of our questions and make us feel calm. She only wants what is best for the dogs and trust they are being well taken care of. It isn’t emotionally easy, but Leigh makes it smooth. We felt so good about your organization, everything was done in a painless manner with love and compassion. We couldn’t have asked for a better outcome.